today I went to watch a movie with my oldest sister and my mom, while my other sister, her son and our niece watched a different one :P so yeah, we split into two teams.. at the end we met eachotheroutside the theater and came back home together.. I don't really have much to say and this will be pretty long, so I better start with it now! first of all, let me tell you about the most recent manga volume I read..
sorry but I just can't stop reading this manga! 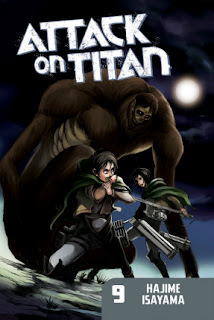 is just too addictive.. and I'm getting ready for the second season of the anime that is coming next month! one thing I liked is that we're able to see beyond the main trio (Eren, Mikasa and Armin), we start to meet the other characters, and that's refreshing! but there's something strange about some of them.. what are they hiding? I feel like this volume left more questions than answers.. but the plot is still interesting and I wasn't able to put it down! maybe is not as good as some of the previous volumes, but it was quite incredible anyway! and that ending.. damn.. another cliffhanger? why? why are you doinf this to me? T__T I can't wait to read the next volume!